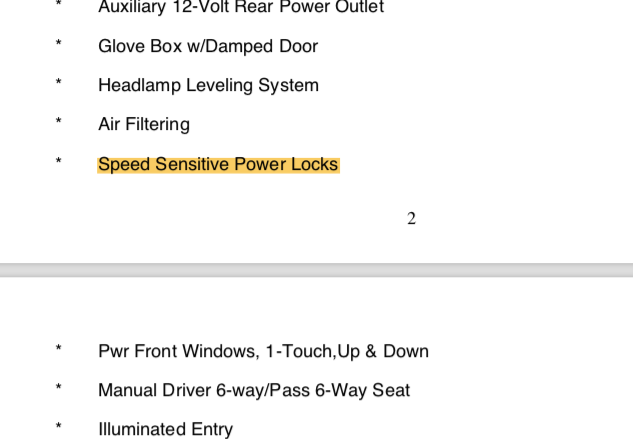 I have a 2018 Compass Limited and I'm missing the speed sensitive auto door lock when vehicle is set in motion. Do your Compasses have auto locking doors when start driving? And if so, how did you set this option? I think its usually around 15MPH when the doors lock. I haven't tested it on my new Jeep, but previous Jeeps would let you open the front doors at any speed even if locked. So if you're testing the doors are locked by trying to open them, it might not be a valid test. I do not open the doors from inside while driving, lol. But normally you hear the sound when the doors lock and you can see it on the interior door handle whether the door is locked or not. I have had 2 Calibers and 2 Neons before and all of them did it when starting to drive. Only my brand new Compass refuses to do that. No problem with my Trailhawk with auto lock they are locked by the time I leave my driveway. Only wish they would unlock the way I want them when I shut off the vehicle. So the Trailhawk has the option, the Limited not. Could you post a picture of the menu setting? My Latitude locks the doors at about 15mph or some amount of time. There is no setting for auto lock in my Uconnect (7" version). However, mine doesn't unlock the doors even with that setting turned on. There is no setting for the auto-lock it is auto. Only option is unlocking the doors, when you shut the vehicle down. I watched my locks today. Backed out of garage put seatbelt on and drove down the driveway, May have gotten to 10 MPH when the locks clicked & locked. Thanks! So I guess my, the European Version of the Compass, is without the function. The US Version with. Auto door lock is not common feature here in Europe. Many people are afraid to get caught in the car in case of an accident. For sure, this feature was not a major topic on the list when they made the new 4th generation uConnect. Let’s wait and see, what comes with the next updates. The only thing what makes me mad is the point, that FCA Germany cut off any channels to download and install uConnect updates. The only way is to go to the dealer and pay for it, even when the car is under warranty. That’s a shame, what FCA did. Sorry, but every car I know has this feature. It is a security feature which all the brands are supporting. Every Volvo, Peugeot, Mercedes, Audi I know, has that. It is a very common feature! I know, many cars offer this feature. The question is, who will use it? It’s a must have for US market and some others, but the demand in Europe is very low. Exactly, at least 4 of the vehicles I owned in the past came with that option. If someone's afraid of that option than simply don't set this option. Nowadays even a SsangYong I drove the other day locked it's doors automatically after vehicle started rolling. It seems as though they simply forgot to ad that feature for the European market. Check your Buildsheet, see if it is also listed in there. Last edited by ntxmac; 04-23-2018 at 07:17 AM. Check you Buildsheet, see if it is also listed in there. I did and the build sheet claims that my Compass is equipped with that option. Need to step on FCA's toes for missing that option. Thank you, I'm happy to know that I'm not the only one! I will be stepping too!! I rather would like to see Jeep working on real issues, e. q. drivetrain or lane assist. 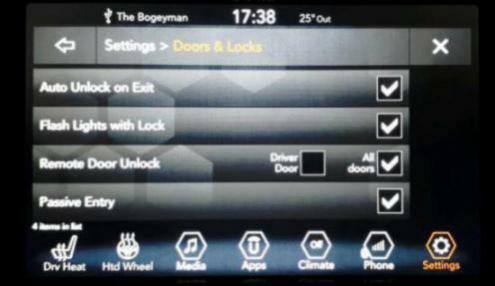 The 'drive off lock at 15mph' is a standard feature and you can turn it 'off' by using the vehicle settings in the U connect. It's stopped working on mine though for some reason, and the u connect menu does not have a setting for on/off. Everything else works without a problem. Standard on all the UK cars I've seen. Hello, has anyone figured how to activate it, for some reason I cannot get the setting in the u connect menus..
After uconnect update that feature is removed 郎 I have the same issue here in Turkey. After uconnect update that feature is removed &#x1f92c; I have the same issue here in Turkey. Now that was a "useful" update.